CKGB Cauvery Kalpatharu Grameena Bank | Govt. Jobs | July 2011 | Officers Scale I | Apply Online up to: 12 August, 2011. 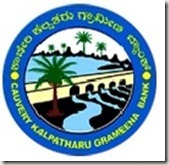 BE/ BTECH (All Discipline) required in Cauvery Kalpatharu Grameena Bank (CKGB). Cauvery Kalpatharu Grameena (CKG) Bank was established on 24th May 2006 by Amalgamation of Cauvery Grameena Bank and Kalpatharu Grameena Bank, Sponsored by State Bank of Mysore. Cauvery Kalpatharu Grameena Bank came into existence on 24th May 2006 by amalgamation of Cauvery Grameena Bank and Kalpatharu Grameena Bank- both Regional Rural Bank’s sponsored by State Bank of Mysore. The objective of amalgamation is to strengthen the Bank so that it can better cater to the needs of the clientele in the farm and non-farm sector more efficiently and contribute for the development of the area. Date of Written Examination: 25.September, 2011. Education: Graduation (any discipline) from a recognized University. Preference will be given to candidates having Computer knowledge. APGVB Andhra Pradesh Grameena Vikas Bank | Govt. Jobs | July 2011 | Officers Recruitment | Apply Online Up to: 23 Aug, 2011. Prathama Bank | Govt. Jobs | July 2011 | Officer JMG Scale-I | Last Date to apply online: 12 August, 2011. VGB Visveshvaraya Grameena Bank | Govt. Jobs | Officers Recruitment | August 2011 | Apply Online | Last Date: 30 Aug, 2011. Posted in Apply online, Bank job, Chemical, Civil, Computer Science, Electrical, Electrical & Power, Electrical and Electronics, Electrochemical, Electronics and Communication, Electronics and Instrumentation, Electronics and Telecommunication, Government Job, Industrial, Instrumentation, IT, Job After Btech, Mechanical, Metallurgical, Mineral, Mining. Tags: 2011., Apply Online up to: 12 August, Cauvery Kalpatharu Grameena Bank, CKGB, Govt. jobs, July 2011, Officers (Scale I) on July 31, 2011 by kavita joshi.